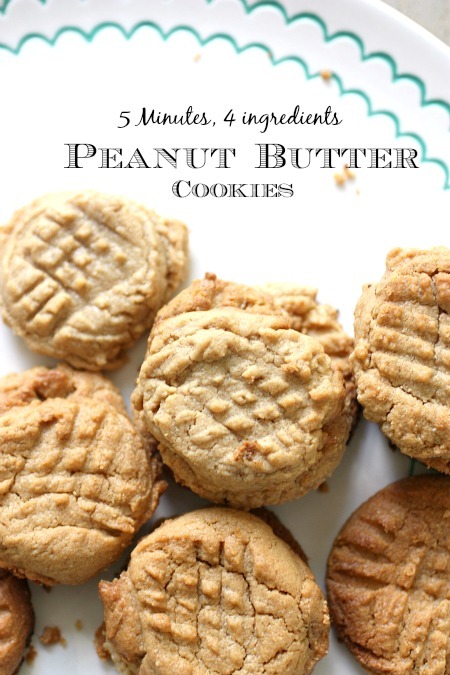 With only four ingredients, you will wonder how you’ve gone any day without making these Easy Peanut Butter Cookies. So rich, so delicious! When your 12 year old daughter comes down the stairs and declares, “I’ve been going through my “bored jar” and one slip says to cook, but I’m going to bake some cookies instead,” you do not complain. You wonder how you’ve been given such a gift, and let her have the kitchen. If you have any good ole fashioned church cookbooks (my favorites), you’ve probably come across this recipe from someone’s sweet grandma. Those treasures just make me giggle because there’s always at least four similar recipes of ever kind of treat, casserole, ice box cake and jello you can imagine. I just love paging through thinking about what it must have been like when they put their prized recipes together. This recipe is a keeper. 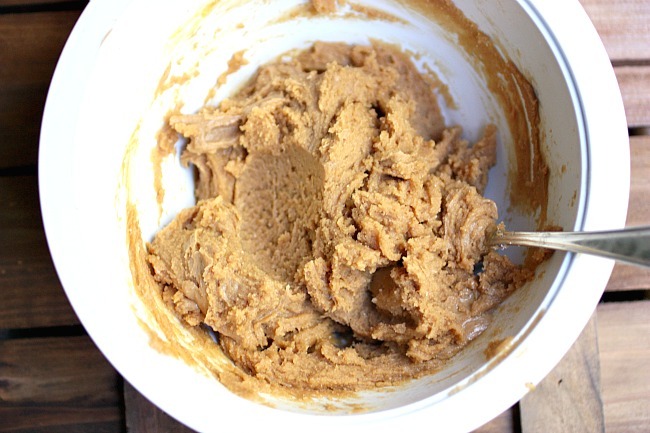 It’s such an easy Peanut Butter Cookie Recipe without flour, plus by substituting a sugar/baking alternative like Truvia or Stevia, you have a perfect low carb treat. I know it’s just not going to seem possible to make cookies without flour, but trust me on this, it works. Plus, it’s another perfect recipe to teach your kids because they’ll have it memorized quickly. Our Emma made it once and now she never needs the recipe. It’s a 1 + 1 + 1 + 1 = cookie recipe. I told you! So easy!! And it’s instant gratification since they whip up so quickly. We make one batch of these all the time and bake them in our toaster oven. This recipe doesn’t make a lot, so I’d double the batter for a crowd. I’ve given you the original recipe below which we’ve made over and over. As is, it’s a perfectly rich Peanut Butter Cookie. It’s quite sweet and so depending on your family, I would make it once as posted below and then alter based on preference. You can cut back a bit on the sugar and they still are delicious. Since right now, I’m watching my sugar intake, but really wanted a little something sweet, I used natural peanut butter and then even added in some quick cooking oats and it was still delicious. I’ve substituted sugar options and they’ve baked very well with them. 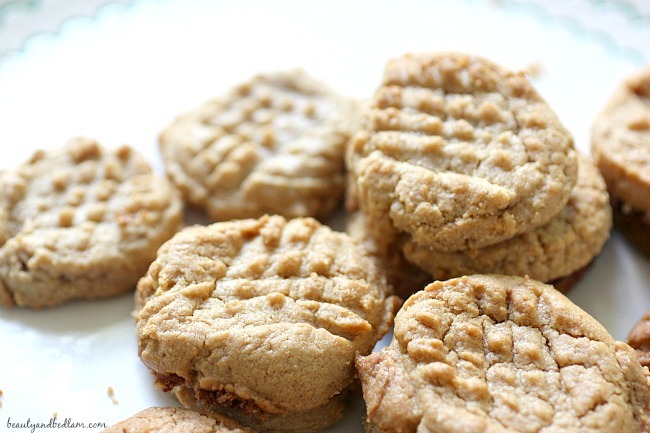 The quality of your peanut butter will most likely effect the way these cookies come out. They tend to be a bit more crumbly right out of the oven, so let them cool completely. I use a cookie scoop and then flatten them a bit with the fork. If you’re making them for guests and want them a bit more “perfect” looking (unlike mine), you can roll the dough firm in your palm first, then push a fork in to them. I am a firm believer in parchment paper. If you don’t use a non stick cookie sheet or baking stone, then line the cookie sheet with it. It will keep them from burning and make them much easier to move to the cooling rack. These turn out moist, gooey, and super rich!! If you like peanut butter, you will love these. 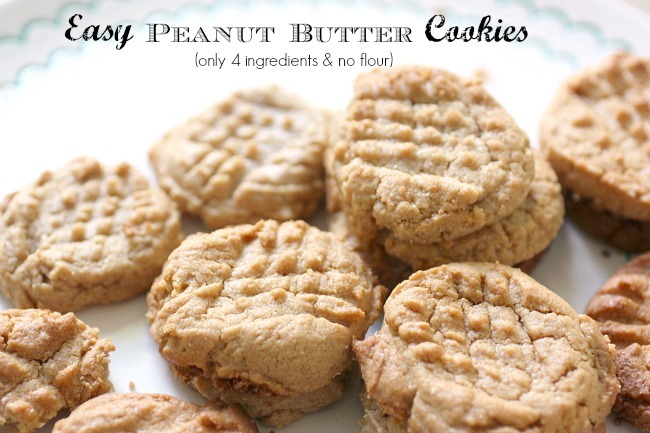 Summary: This easy Peanut Butter Cookie recipe (without flour) makes wonderfully soft cookies. Drop by teaspoonfuls onto non stick cookie sheet, baking stone or line with parchment paper. Bake for 8 – 10 minutes or until lightly golden. Let cool before removing. They’re fragile when first coming out of oven. For variety, press M&Ms into the cookies immediately after removing from oven. ** see Notes in post above. These sound perfect!!!! I’m going to play around with the amount of sugar. What type of Sugar substitute do you use? I’ve tried Swerve and it’s so gritty and “cool” tasting. We tossed out our batch. Mmm, such a classic and so delicious. I love a cookie recipe I can memorize and whip up whenever the urge hits me. They look perfectly delicious! Any chance you have the carb per cookie breakdown? My daughter is type 1 Juvenile Diabetes and so it’s great this is low carb, but do you know the nutritional info and total carbs? Looking absolutely delicious! Will try tonight but with add some flour and little sugar too for my taste . Hope it comes out well. And please keep sharing more recipes with us. Thanks.